#1 How to Prepare for Disaster Survival? Preparing for disaster survival can be difficult. That’s why we’re here to help! 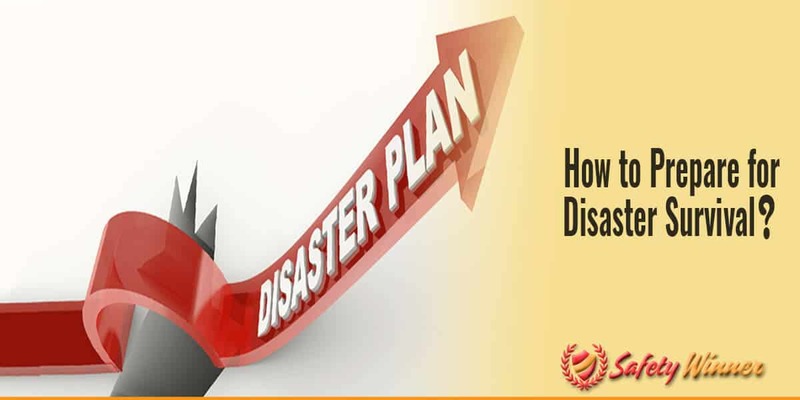 With our comprehensive guide, you will be able to be prepared to survive virtually any disaster. That being said, continue reading to discover the ins and outs of disaster survival. In order to adequately prepare for disaster survival, it’s important to understand the basics of disasters. First and foremost, disasters are completely unexpected. Well, they’re usually completely unexpected. So, don’t think that you will have time to create a comprehensive plan of how you can survive a disaster a few weeks before it occurs because you will most likely not know when a disaster is about to happen. Disasters usually cause chaos. This makes sense when you think about it. After all, if everything you know and your routine abruptly and drastically changes, you’re most likely going to panic. It’s important to keep this in mind because you can help calm yourself and others down during a disaster. Common amenities, such as electricity, will most likely be unavailable. So, be ready to tackle what life would be like in the olden days because you’re most likely not going to have access to electricity, heat, or even safe water. Although you most likely won’t be able to create a specific plan that’s detailed and relevant to a specific disaster that’s going to occur at a certain time, you do have the opportunity to communicate a general plan with your family. Start a disaster survival crisis conversation when everyone is together. Then, you can discuss important aspects, such as where everyone will meet in the event that everyone needs to evacuate the house. In order to keep track of all your general plans, create a digital and print version of your plan. Everyone can keep the digital version in the note section of their phones, so they can refer to it whenever they want. As for the print version, this should be accessible in a communal place, and serves the purpose of informing anyone what to do in the event they don’t have access to the digital plan. Events happen fast during a disaster. In fact, survival chances also change quickly during a disaster. That’s why it’s important to be up and on your toes during a disaster. In other words, if a disaster occurs, you should be prepared to be alert and quick. After all, every second counts. So, don’t hesitate to make any decisions or seek safety or professional help if possible during a disaster. There are a few different ways you can create a disaster survival kit. Firstly, you can purchase a survival kit from a store, such as Amazon that is specially designed for disaster. You could also create your own disaster survival kit. Food – One of the biggest things you have to worry about during a disaster is how you’re going to feed yourself and your family. That being said, keep an array of nonperishable food items in your disaster survival kit that are rich and dense in protein and nutrients. Canned food and protein bars are great options. Water – Much like food, water is a pretty big deal for surviving a disaster. There are a few ways you can go about this. Your first option is relying on a water filter or tablet that is designed to rid water of toxins, so you can have clean drinking water. You can also purchase an abundance of water bottles or bagged water to serve as a way to provide your household with clean drinking water. First Aid Kit – While you don’t necessarily need anything extravagant in terms of first aid items, you should have a standard first aid kit in your survival kit. This means that you should have an array of band aids, bandages, medicines, and medical tools that can help you patch a wound or treat an infection. Blankets – It’s important to stay warm during a disaster, especially if you’re injured or ill. Blankets can also be helpful in protecting you from environmental hazards, such as falling debris. Documents – You never know where you might end up during a disaster. For example, you might have to seek shelter in a different area. While you will most likely not be required to provide identification during an emergency, you never know what could happen. That being said, keep copies of everyone’s license, social security card, birth certificate, insurance, and passport in your household. Knife – You will most likely need a knife to cut things, such as food and cloth, as well as to potentially defend yourself. Flashlight – It’s important to have a secure way to provide light in case you don’t have access to electricity. Matches – You will most likely need to start a fire to provide light and warmth. Therefore, matches are one of the easiest ways to ignite a fire. Whistle – Whistles are great for rounding everyone up during an emergency, as well as drawing attention to yourself in case you see someone from afar that can help you and your loved ones. Your disaster survival kit is critical to your chances of survival. Ultimately, your disaster survival kit is your first line of defense. Without it, you don’t even have a plan a. In fact, you have a significantly lower chance of surviving a disaster without a disaster survival kit. That being said, it’s important to make sure that you have at least one disaster survival kit in your home. This kit should be in an easily accessible place that everyone in your family knows about. After all, if you need to use the disaster survival kit at a moment’s notice, you aren’t going to want to have to run around the entire house just to find it.